Creating BOM or Bill of Materials is the starting point for every PCB Assembly manufacturer who builds products no matter what industry it is. BOM can be compared with a recipe or shopping list for a dish; it's a complete list of components, mechanical assemblies and even sub-assemblies for a finished product. For any product, BOM explains parts that are required, how to acquire them and where to acquire them from, as well assembly instructions for a product. BOM generally contains all the data regarding a product, it is therefore required by many departments (such as manufacturing, documentation control, contract manufacturers, logistics, purchasing, engineering and design) to finalize a product correctly. Generating an accurate, updated and organized BOM is critical since it acts a guideline for better results from manufacturing, parts sourcing and outsourcing activities. Creating a revision-controlled and correct BOM is very important for companies that have to outsource manufacturing. Delays is production should be expected if BOM handed over to suppliers or contract manufacturers is incomplete or not accurate. 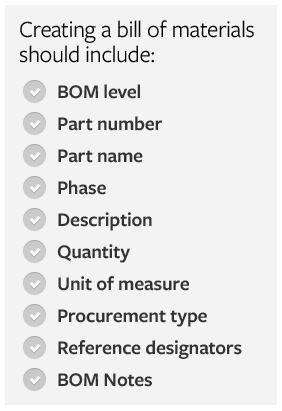 BOM Level: Every component or mechanical assembly should be assigned a serial number to explain its location in the BOM hierarchy. This is to enable everyone with the knowledge to BOM to decrypt it easily. Part Number: In order to quickly recognize and reference parts, a part number should be assigned to each part. Manufacturers typically choose non-intelligent or intelligent part numbering methods. Multiple part numbers for a single part are to be strictly avoided no-matter what scheme you use. Part Name: Each assembly or part should be assigned a distinct name which helps in recognizing different parts quickly. Phase:	It's important to record the stage of each part for classification purposes for example, as an indication, a part can be termed “In Production”. “In Design” or “Unreleased” could be used for unapproved or new parts. Indicating phase helps in creating generating correct project timelines and in tracking progress which are required for New Product Introduction (NPI). Description: A detailed and accurate description should be provided which helps in identification of various parts quickly and easily. Quantity: In order to assist in manufacturing decisions and purchasing process quantities of the used assemblies, sub-assemblies and parts should be recorded. Measurement Units: Measurement units of each part in which it is to be purchased or utilized should be classified. Typically “each” is used but other units such as ounces, feet and drops can be utilized too. In order to purchase and deliver the correct quantities of parts to the production line, consistency of measurement units for same part types is the key. Type of Procurement:Method of manufacturing or purchasing (i-e: off the shelf, made to specification, etc.) for every part is to be noted down which helps in streamlining purchasing, manufacturing and planning activities. Reference Designators:Reference designators that mention the placement of parts in your BOM should be included if your product contains Printed Circuit Board (PCB) Assemblies. Inclusion of this information in BOM helps in pipelining the process to avoid confusion in future which eventually saves time. Next：PCB Assembly: What is Wave Soldering?